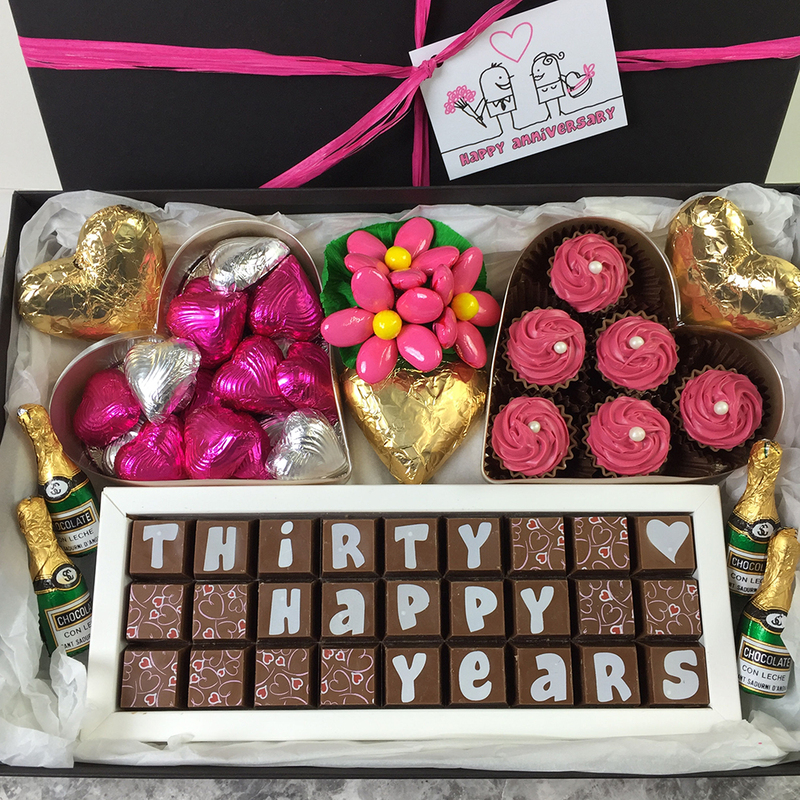 A personalised 30th wedding anniversary gift, packed with a selection of delicious chocolates. Personalise this 30th anniversary chocolate box with the names or any message you choose in the 3 rows of 9 blocks. Please leave spaces between the words which will be filled with pretty heart pattern chocolate blocks. If you would like a single heart block as shown in the photo please use $ in the personalisation boxes. Carefully packaged in a smart white box with a clear cover which displays your message perfectly. Included in this lovely gift is a heart shaped box of 6 cupcake shaped chocolates with a delicious raspberry flavour. The second heart shaped box contains 20 foiled milk chocolate hearts and 3 larger foiled milk chocolate hearts handmade and foiled by Cocoapod. Both these boxes are finished with narrow organza ribbon in complementary colours. All these chocolates are displayed nestled in tissue paper into a A4 black solid card box which is tied with raffia ribbon and finished with an anniversary tag, a truly luxurious 30th wedding anniversary present packed with wonderful chocolates. Raspberry Cupcake Ingredients: sugar, cocoa butter, vegetable fat (palm, rapeseed, sunflower); whole MILK powder, invert sugar, skimmed MILK powder, stabiliser: E422 (glycerine), pectin (E440); glucose syrup, LACTOSE (MILK), cocoa mass, cream (MILK), butter concentrate (MILK), fructose, Framboise 50% vol., raspberry concentrate, emulsifier: SOYA lecithin; red grape juice, raspberry, dextrose, natural raspberry flavouring, colours: E120, E160a, E171; natural vanilla flavouring, rice flour, acidity regulator: E330, natural flavouring, glazing agent: E904, vegetable oil (coconut), salt. Allergens are in CAPITALS. May contain traces of gluten, eggs & nuts. Contains alcohol. All chocolate has a best before date of at least 6 months. This item will be dispatched 1-2 days after receipt of the order. Delivery will be 3-4 days after placing your order (£3.75). We will inform you once your 30th Anniversary Chocolates have been dispatched.